Is there a reward for all the things we do? Hula hoop, sack race, football, netball, baseball, basketball, volleyball, hop-scotch, cricket and dancing, to name a few, are listed among recreational and competitive activities. They can also be counted as various ways to exercise which, in today’s society, is the pivotal focus in health care. Each day our way of thinking is influenced by modern measures and advancement. Hence the concept of solely looking at isometrics as an outdoor activity has been erased. I take swimming as a primary example. It has become portable, fully inducted in the confines of the indoors which is a popular, all-season, and convenient venue for everyone. Inclement weather conditions can no longer hold us hostage. Besides that, the indoor venue also overrides the stance taken against exercise by “excusemongers” and “lazybones.” Am I guilty? Well, if keeping up with exercise means staying healthy then it’s imperative to go with the flow. Many people have set aside days and evenings in which they will participate in a range of exercises for their mental and physical well-being. Two popular days are Saturday and Sunday. On those days if I were to commit to exercise programs I would definitely choose the afternoon hours because in the morning time, after I awake, I usually remain in bed and indulge in a couple hours of quiet time. After all, who wouldn’t want to do this? It is a great way to unwind after a week of rising early coupled with the diatribes of subway commuting to and from work. Sometimes my plan fails because of the zealous behavior of somebody, going door to door to share religious beliefs. Situations that force me out of bed before I am fit and ready to do so usually leave me feeling unaccomplished. On the other hand I have been told many times not to remain in bed, on any given day, during sunrise because ultimately I will be “mash-up” (lethargic) for the remainder of that particular day. Have I found truth in this? I will also take into consideration the old adage: The early bird catches the worm. If I should argue this saying, I would certainly have to blame the worm because if it hadn’t been up and about early, the bird wouldn’t have caught it and made a meal of it. Whether or not these beliefs are embraced, the bottom line is, when it comes to nurturing one’s self it is significant that moments of leisure be one of the factors. Taking a rest from daily routine is just as beneficial as the physical exercises we require for good health. The conversation was just as interesting to Nancy as it was to me. “Do you remember, Yellow Man?” she asked. “Yes,” I replied with enthusiasm as I brought the lively Jamaican reggae artist to mind. Nancy chuckled, “So what do you think he was singing about in his song called the Hula Hoop?” I released a long sigh and then switched the phone from one ear to the next before I answered her. “Girl, I would have never guessed that bed-work was the message in that song. “Is it true, though? Frankly, I was more focused on the lively rhythm of the song, not words.” “Now you know,” she said. “You darn right about that, Nancy. Can you picture Yellow Man on stage singing that song and running from one end to the next with his dark glasses on and mike in hand,” I blurted. The visual was so good that we could not contain our laughter. 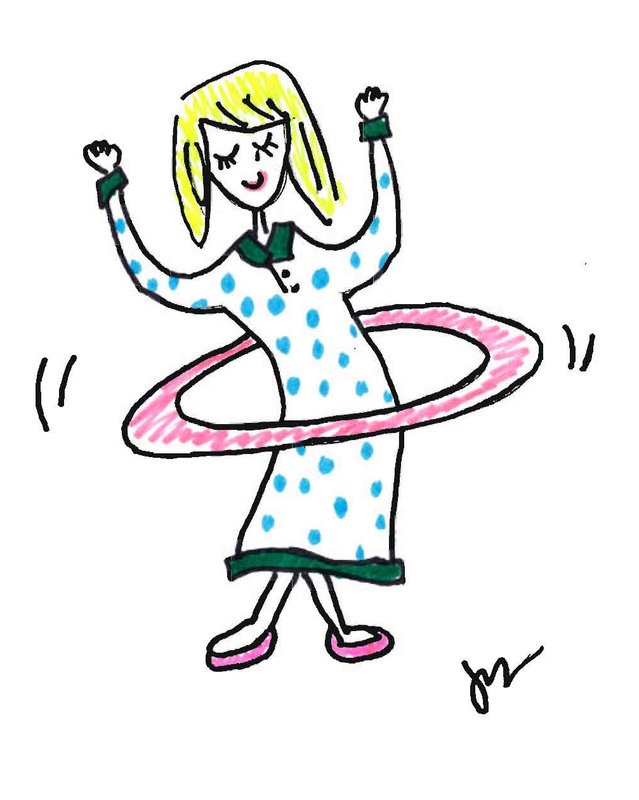 Eventually as we settled I recalled a particular exercise from my childhood which harbored the traits of hula hoop dancing. Nancy was anxious to hear about the exercise so I proceeded by telling her that back in the day the older girls in my village sometimes turned the idle time of the younger girls, including me, into good use. They taught us to crochet, sew, cook, wash, iron, dance and told us what to do when Aunt Janey from Red Hills (menstruation) dropped by for her visit. Most importantly they told us what to expect in a marriage. Marriage was the ultimate relationship for any woman, during that time. They told us that besides being able to wash, cook and clean we should also know how to “shake in bed.” Each time they mentioned the word shake we would put our hands to our mouths and giggle in them because to us, kids, “shake in bed” meant standing in the middle of the bed and playfully shaking our bodies. The older girls laughed at us when they found out about our idea of “shake in bed” and with that they vowed that one day they would teach us to do it the preferred way. The day of learning to “shake in bed” finally arrived. Two of the older girls gathered four, younger girls including me, and took us to a secure spot, a house. I remembered how they laughed mischievously as they told us to lie down with our backs against the polished wood floor and pretend that: a cup was placed beside us on the right, a saucer on the left and then directly above us on the ceiling was a bungle of grass. With that mental picture we were instructed to point our right hips at the cup, the left hips at the saucer and then thrust our bodies from the waist down to the hips at the bungle of grass. The exercise wasn’t an easy one. Our bodies shifted in all directions on the shiny wood floor. To ease our clumsiness they taught us a one-line rhyme: From the cup to the saucer to the bungle of grass. We recited the rhyme and did the moves umpteen times until our performance seemed to satisfy them but not for long because they decided to alter the rhyme to improve speed. Hence it became… cup, saucer, grass. After all that they still wanted us to increase the speed so they suggested that we got rid of the cup and the saucer and just do “grass.” We laughed and giggled and worked our little bodies dog-tired as we repeated grass,...sometimes turning grass into the curse-word rass. If only our parents, especially our mothers, knew what had taken place they would have whipped our behinds or pretended that it wasn’t anything to be alarmed about so as to keep us in the dark. The phone felt hot against my ear by the time I had finished sharing, with Nancy, the exercise that the older girls had taught four younger girls including me. 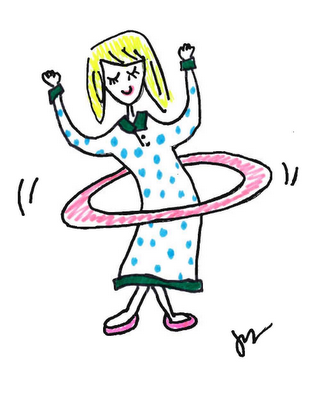 Nancy and I were laughing at the naughtiness of it all when suddenly it occurred to me that I should challenge an imaginary game of hula hoop while lying in bed. This would prove to me whether or not the older girls were really on target with their “shake in bed.” So while Nancy babbled I quickly got rid of the extra linen on the bed and then lay on my back, ready. “Hey Nancy,” I am going to try dancing the hula hoop right here in the bed,” I told her. “Yes do it,” she said, laughing. Hence, I raised my hands above my chest, hugged an oversized portion of the air and then began moving my waist and hips, dancing the hula hoop. “Wow Nancy, I am hula hooping. I could feel laughter welling up inside, the kind that brought sweet tears. “This seems like the real deal compared to that of the older girls,” I told her, dancing away. “That is great,” Nancy mumbled. I paused, breathe in and out and then began hula hooping again. “I really like this shake in bed much better than the one the older girls had taught me. To hell with their From the cup to the saucer to the bungle of grass, I decided.” Nancy sneezed. “You have no sense,” she said. “Woo hoo!” I shouted, feeling happy. “Hear the ol’ idiot,” Nancy commented, laughing. “Ol’ idiot,” I repeated. “For your information I have more sense than you could ever imagine. Wee! Wee! Ok, I am in this hula hoop business for the long haul. Nancy, please get off the phone now. I am going to get a hula hoop and see if I can make up for the years lost.” I then quickly hung up the phone on Nancy’s laughter. Mom, I don't know what to say about you. You are always bringing laughter in our lives. As you know on 6/20/12 as I read your newest blog I am facing some rough health issues however, your blogs especially this one, just took all my sorrows away. For this mother, I do appreciate your continued efforts to always mek mi laugh 'til tears roll dung mi eyes or mi piss in mi pants. Thanks! Much love to you.